The local area is home to a number of important protected nature reserves, where you can stretch your legs in stunning countryside with excellent views and get up close and personal with the local wildlife and beautiful flora. Berwickshire and Northumberland Coast European Marine Site – the Berwickshire coastline is one of high cliffs interspersed with rocky coves and small beaches, behind which are miles of beautiful rolling farmland. Owing to the wealth of seabird and marine life, most of the coastline is now a preserved Coastal European Marine Site. For images and information on the local marine life have a look at the Cross Border Currents website. 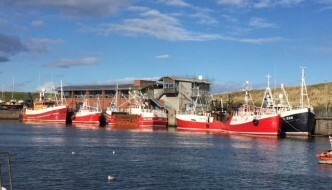 Eyemouth and St Abb’s Voluntary Marine Reserve – established in 1984 by local fishermen, divers and conservationists, this was the first reserve of its kind in the UK. Periodic events and activities are organised by the marine ranger and are listed on the website, where you will also find news of marine life sightings. St Abb’s Nature Reserve – the sheer 300-ft cliffs of St Abb’s are a few miles north of Eyemouth and are managed by the National Trust for Scotland. The reserve is famous for its colonies of cliff-nesting birds, including guillemots, kittiwakes, razorbills, shags, fulmars, puffins and herring gull. There is an excellent tea room, gallery and textile shop, as well as a ranger service. A remote camera link allows visitors to observe birds during the nesting season. The Berwickshire Coastal Path offers wonderful cliff walks starting in Eyemouth, going north to St Abb’s Head and south to Berwick-upon-Tweed. For keen walkers with more time and energy to spare, the Southern Upland Way starts slightly further north at Cockburnspath and ends in Portpatrick on Scotland’s West Coast. To the south, St.Cuthberts Way will take adventurous walkers from Melrose to Holy Island (62 miles) through the beautiful Cheviot Hills. If you’re looking for something more educational, or perhaps the weather has not been good to you, there’s always something to help you while away the hours – and keep the kids entertained. Eyemouth Museum in Market Square offers a fascinating insight into the town’s colourful history. Gunsgreen House is perhaps Eyemouth’s most iconic building. The handsome white Georgian building overlooking the harbour was built by John & James Adams for a local shipping merchant. The building has been restored, and as part of the project a Museum of Smuggling is now open to the public March to October. On the clifftops south of the harbour is the challenging course at Eyemouth Golf Club, offering you the chance to pit your game against the proud winner of the “Most Unusual Hole in Scotland” award. The clubhouse has panoramic views over the bay from the bar and Bayview restaurant. The Scottish Borders is home to many examples of lavish country living, some of which can be visited, including the recently refurbished home of Sir Walter Scott, Abbotsford House. The historic walled market town of Berwick upon Tweed is only 15km south of Eyemouth, just over the border into England. A good reliable bus service operated by Perrymans runs every day. Scotland’s capital city and all the history, culture and retail therapy it has to offer is only an hour away by car. You can also get there by bus from Eyemouth or train (45 mins) from Berwick upon Tweed. The largest city in North East England, Newcastle upon Tyne is approx. 1hr 45mins away by car. You can also get there by bus or train from nearby Berwick upon Tweed.